What are you looking for? Here's a quick overview to get you there fast! Featured Products Listed below, these products are hot right now. Search Products Search by keyword, topic or resource type. Products Index A complete alphabetical listing of our products catalog. What's New The latest and greatest resources available to you. These links are also available at the top of every page of the Products Catalog. We've done the homework for you and found the best solutions for your safety needs. Our partnership with National Safety Council, J.J. Keller, CLMI and others means preferred pricing for you and when you purchase through us, your dollars support injury prevention programs that make all Minnesotans safer. 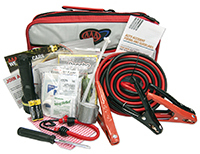 This great compact kit keeps you prepared for many road-side emergencies. Keep your employees, yourself and your family safe by putting one in every vehicle! Protect your family and your employees with this portable weather radio from AcuRite. It continuously receives and displays National Weather Service weather bulletins, alerts, watches and forecasts, U.S. Emergency All Hazards bulletins, and local Emergency Alert System (EAS) bulletins and warnings. Need to seek shelter? Just grab it and go!